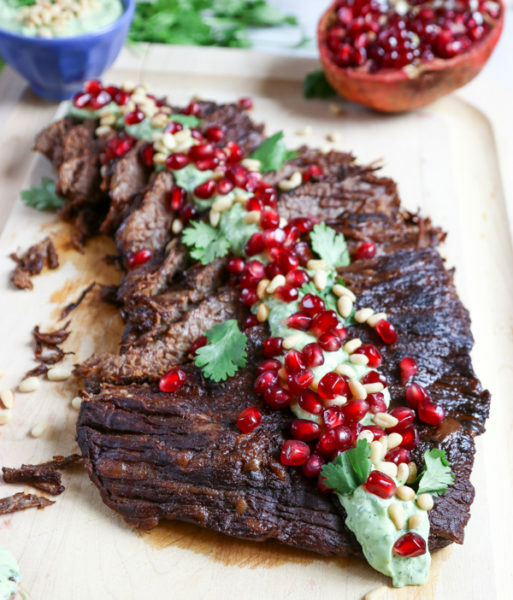 It’s hardly Rosh Hashanah without brisket! 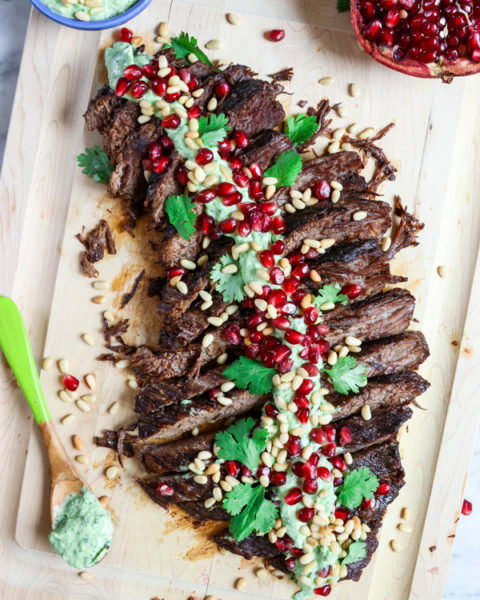 And this Pomegranate Brisket with Avocado Cilantro Aioli is a winner! Y’all know how much I love brisket. Let me count the ways. It’s meaty. Impresses/feeds a crowd. Looks hard but isn’t. Leftovers are even better. Brisket + eggs = best breakfast ever. Shall I go on? Once again, I used Kroger’s Simple Truth Organic line because it is just so darn affordable! Why does organic have to be sooo expensive? 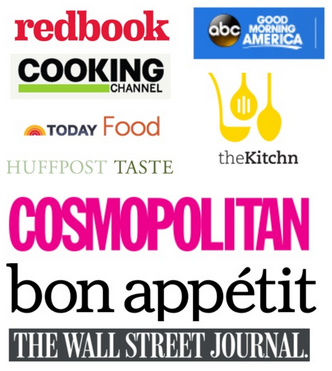 And I LOVE to host, but cooking for the holidays can get pricey. This 32 oz bottle of organic 100% pomegranate juice is under $4! That’s crazy. So you can save your pennies for meat. Mmm meat. I also stocked up on spices, raw honey, canola oil and tomato paste for my brisket. 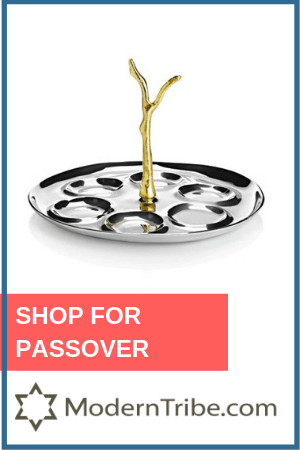 Check out Kroger’s website for kosher ingredients, inspiration and Rosh Hashanah recipes. Oh baby. 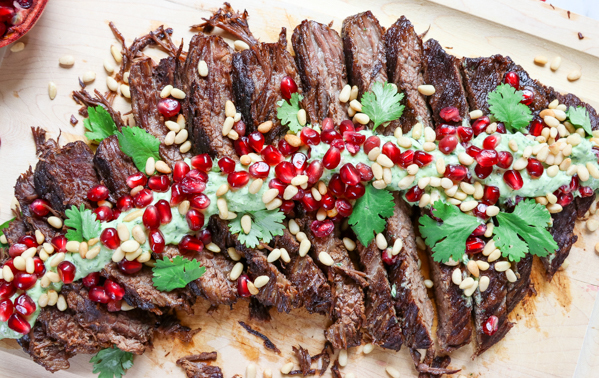 We could just serve this brisket as is and be good to go. 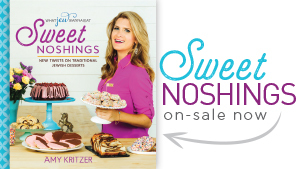 Rosh Hashanah is a fun one to cook for because of the fall flavors and all the symbolic foods. 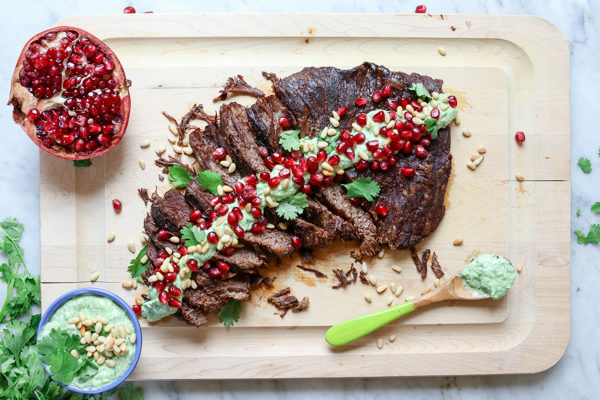 Did you know pomegranates are considered a new fruit for the new year (this year is 5779 baby!) and also it’s said that there are 613 pomegranate arils in each one, the same as the number of commandments?? I’m not counting, so I’ll take their word for it. Ready for my close-up. 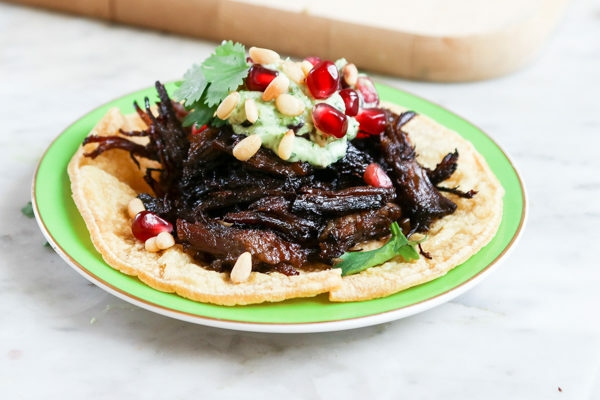 Bonus points: Fry up some leftover brisket and make tacos! It's hardly Rosh Hashanah without brisket! 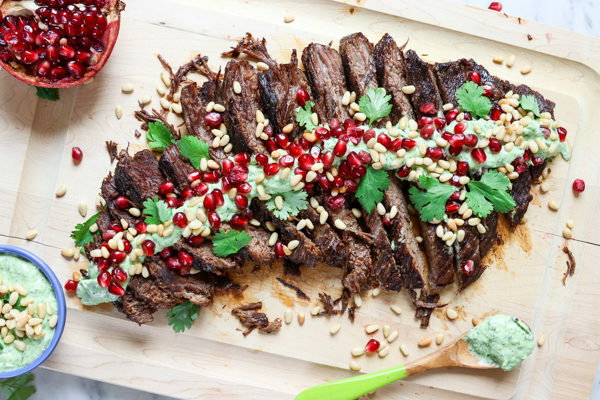 And this Pomegranate Brisket with Avocado Cilantro Aioli is a winner! 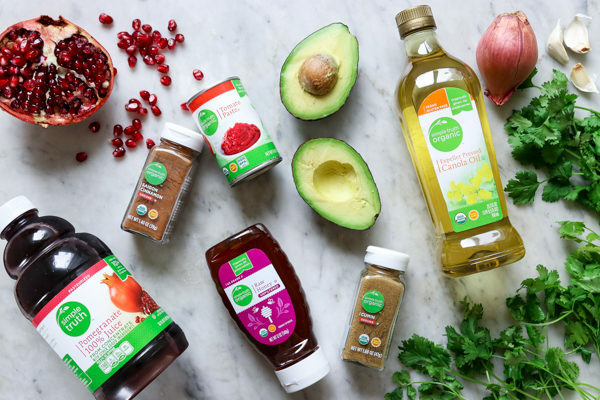 In a large bowl, mix together 1 cup pomegranate juice, 2 tablespoons canola oil, cumin, cinnamon, honey, chili pepper flakes, salt and pepper. 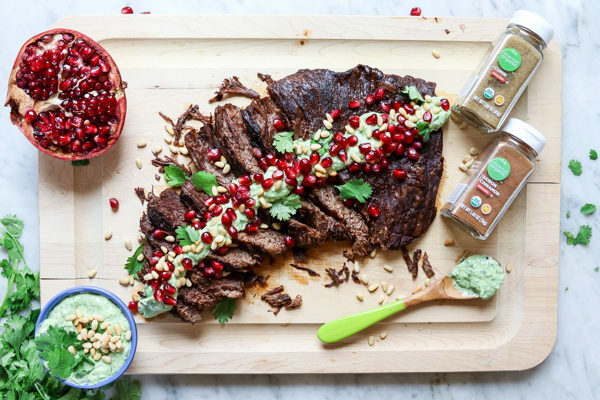 Place brisket in a large deep pan, top with pomegranate juice mixture, cover tightly and refrigerate to marinate at least 2 hours but ideally overnight, flipping every so often. 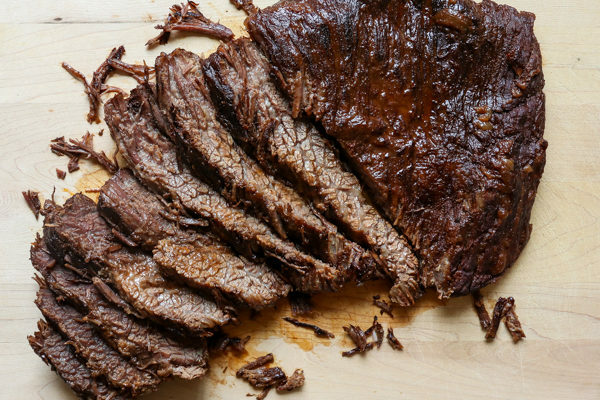 The next day, bring the brisket to room temperature. Remove from the marinade and dry well. Heat remaining 2 tablespoons canola oil in a large, heavy bottomed pot or dutch oven over medium heat. Add brisket, fat side down. Cook without moving for 5-7 minutes until browned and fat is rendered. Then turn the brisket over and cook the other side until browned, about 3 more minutes. 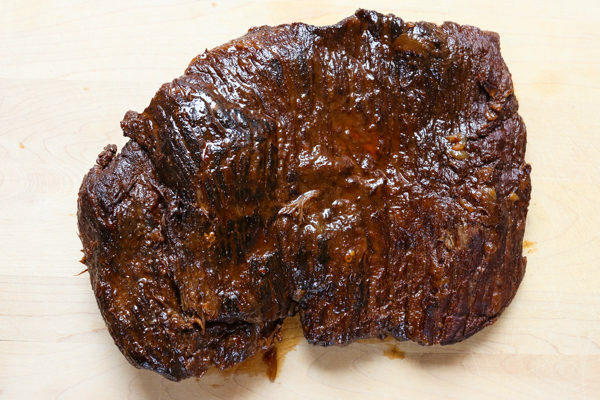 Remove and place the brisket on a plate. Lower heat to medium low. Then add the shallots and garlic. Saute until golden, about 5 minutes, making sure to scrape up all the pieces stuck to the bottom, lower heat if it starts to burn. If that doesn't help, add a splash of water. Add tomato paste and cook while stirring until browned. Scrape up everything on the bottom of the pan. 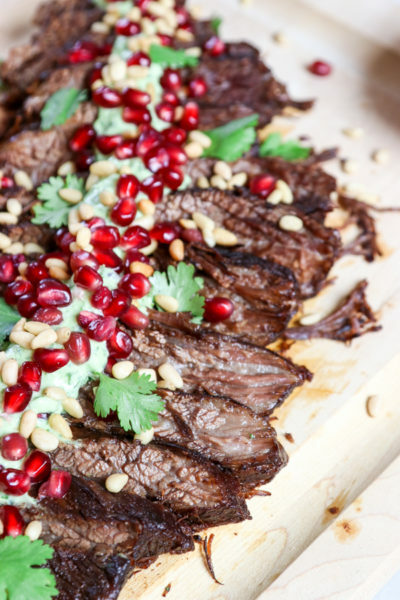 Then add one cup pomegranate juice and remaining marinade you used to marinate the brisket and bring to a simmer. Add brisket, lower heat to low, cover, and braise for 3-4 hours until very tender but not falling apart. When the brisket is ready, transfer the brisket to a large plate, fat side up. Bring the sauce to a simmer and reduce sauce is thick, about 20 minutes. Adjust with salt and pepper to taste. 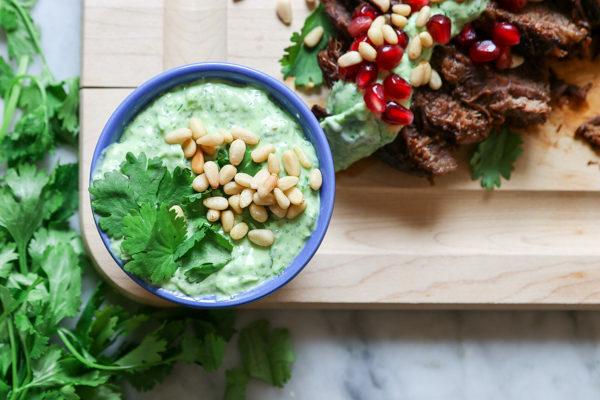 From this point, you can refrigerate the cooled brisket in the cooled sauce until ready to serve, or let brisket rest for 20 minutes, slice against the grain and top with sauce and aioli and garnishes! 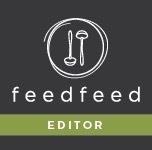 Speaking of the the aioli, to make it, place all the ingredients in a food processor or blender and mix until well combined. I don't even dry the cilantro off too much as the water helps it all come together. Season with salt and pepper to taste and add water as needed to so your sauce is thick but pourable. Also need 2-12 hours to marinate. This post is sponsored by Kroger Simple Truth Organics. 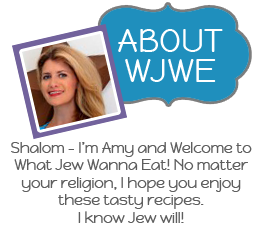 Thank you for supporting brands that support WJWE!